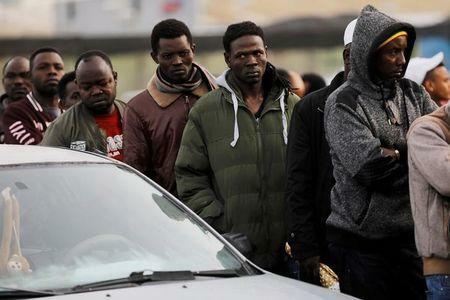 JERUSALEM (Reuters) - Israel will release about 200 jailed African migrants in the absence of a final deal to deport them and thousands more Eritrean and Sudanese men who entered the country illegally, the Interior Ministry said on Sunday. Most of the 200 men set for release were sent to a desert prison in recent months to await deportation to Uganda. But with negotiations continuing over a deal with Uganda, Israel's Interior Ministry -- which has faced court challenges by rights groups over the detentions -- issued a statement on Sunday saying it would begin releasing the migrants. The Israeli government says the 37,000 migrants in Israel are job seekers and that it has every right to protect its borders. The migrants and rights groups say they are seeking asylum and are fleeing war and persecution. About 4,000 migrants have left Israel for Rwanda and Uganda since 2013 under a voluntary programme, but Prime Minister Benjamin Netanyahu has come under pressure from his right-wing voter base to expel thousands more. Israel started handing out notices to male migrants from Eritrea and Sudan in January, giving them three months to take the voluntary deal with a plane ticket and $3,500 or risk being thrown in jail until they are deported. Israel’s Supreme Court, however, has issued temporary injunctions to give more time for petitioners to argue against the plan. On Tuesday government representatives told the court that an envoy was in an African country finalising a deportation deal after an arrangement with Rwanda fell through. Official documents submitted to the court said authorities have identified close to 8,000 Eritrean and Sudanese migrants it would potentially deport under compulsory expulsion.